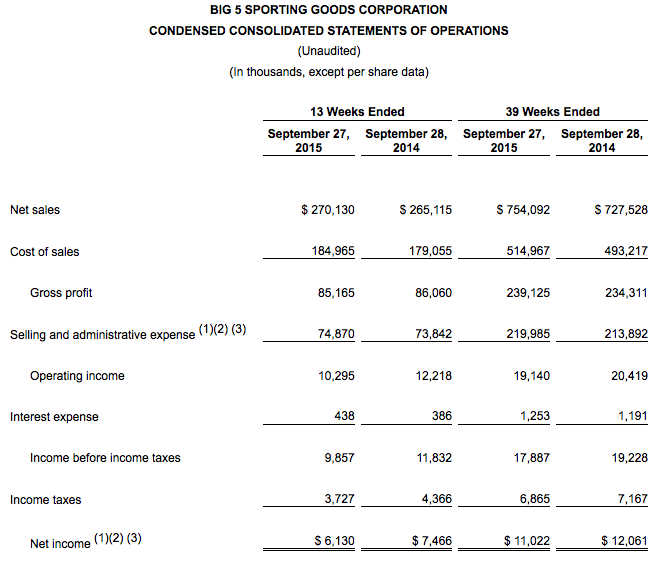 Big 5 Sporting Goods Corp. reported its second-quarter earnings came in line at the lower end of guidance while sales fell short of plan. Sales were hurt by challenging comparisons against strong World Cup sales in 2014 as well as the continuing impact of the drought in its Western markets on certain summer-related product categories. Sales in the quarter ended Sept. 27 increased to $270.1 million from net sales of $265.1 million for the third quarter of fiscal 2014. Same store sales decreased 0.4 percent for the third quarter of fiscal 2015. Comps had been expected to grow in the low single-digit range. Gross profit for the fiscal 2015 third quarter was $85.2 million, compared to $86.1 million in the third quarter of the prior year. The company's gross profit margin was 31.5 percent in the fiscal 2015 third quarter versus 32.5 percent in the third quarter of the prior year, reflecting a decrease in merchandise margins of 51 basis points and an increase in store occupancy costs as a percentage of net sales. Selling and administrative expense as a percentage of net sales was 27.7 percent in the fiscal 2015 third quarter versus 27.9 percent in the third quarter of last year. The Company's selling and administrative costs for the fiscal 2015 third quarter increased $1.1 million from the prior year due primarily to higher employee labor expense and operating expense to support the increase in store count. Net income for the third quarter of fiscal 2015 was $6.1 million, or 28 cents per diluted share, compared to net income for the third quarter of fiscal 2014 of $7.5 million, or 34 cents per diluted share. The retailer expected to earn EPS in the range of 28 cents to 34 cents a share. Wall Street consensus estimate had been 30 cents a share. For the 39-week period ended September 27, 2015, net sales increased to $754.1 million from net sales of $727.5 million in the comparable period last year. Same store sales increased 1.7 percent in the first 39 weeks of fiscal 2015 versus the comparable period last year. Net income was $11.0 million, or $0.50 per diluted share, including $0.06 per diluted share of charges for a legal settlement and expenses associated with the Company's publicly disclosed proxy contest, for the first 39 weeks of fiscal 2015, compared to net income of $12.1 million, or $0.54 per diluted share, including $0.02 per diluted share of non-cash impairment charges, for the first nine months of fiscal 2014. The Company's Board of Directors has declared a quarterly cash dividend of $0.10 per share, which will be paid on December 15, 2015 to stockholders of record as of December 1, 2015. In the third quarter of fiscal 2015, the company repurchased 181,969 shares of its common stock for a total expenditure of $2.0 million. For the year-to-date period through September 27, 2015, the Company repurchased 278,242 shares of its common stock for a total expenditure of $3.2 million. As of September 27, 2015, the company had $3.9 million available for future share repurchases under its $20.0 million share repurchase program. For the fiscal 2015 fourth quarter, the company expects same store sales to be in the low negative single-digit to low positive single-digit range and earnings per diluted share to be in the range of $0.10 to $0.20, including approximately $0.01 per diluted share of consulting expenses related to evaluating store growth strategies and potential profit improvement opportunities. As a result of the fiscal calendar, the fourth quarter of fiscal 2015 will include 14 weeks and the fourth quarter last year included 13 weeks. The company's same store sales guidance above reflects comparable 14-week periods. During the third quarter of fiscal 2015, the company opened one new store and closed one store, ending the quarter with 439 stores in operation. 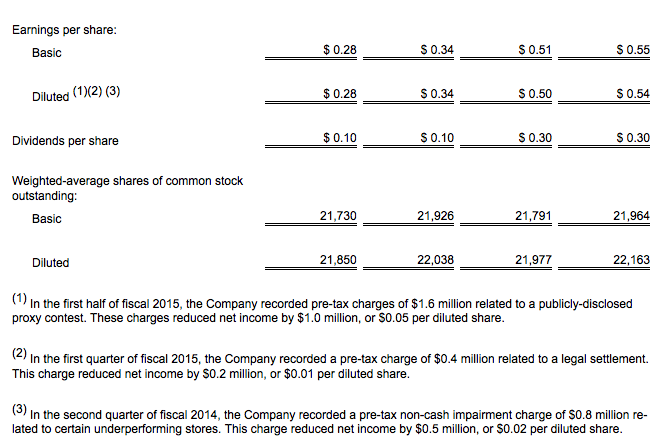 For the fiscal 2015 full year, the company currently anticipates opening five new stores and closing five stores.